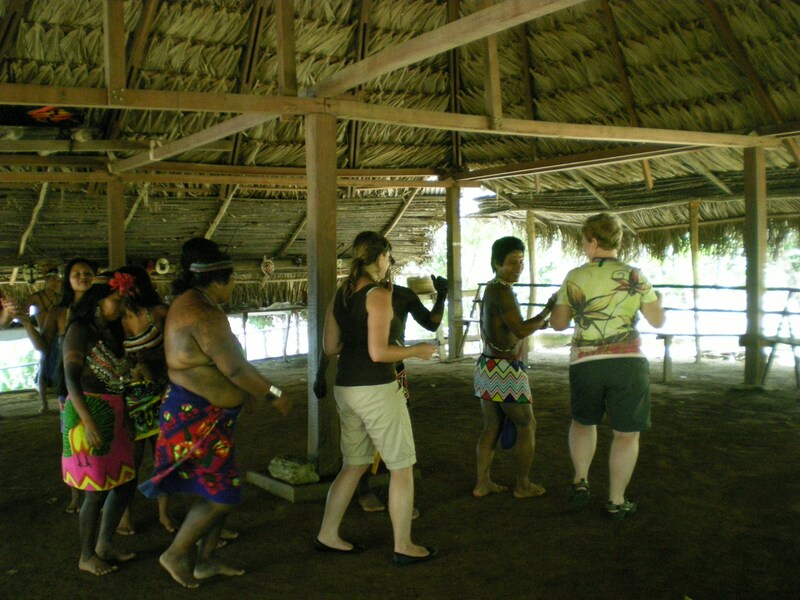 One of our tours that had interested me the most since I´ve started working as an Intern in the EcoCircuitos-office was the tour to the Embera indigenous tribe In the Chagres National Park. I had heard that it is a fascinating experience, and therefore I felt very fortunate when my supervisor Annie sent me on the Embera-tour with guide Fabio, driver Roberto, and our clients Mr. and Mrs. Sameth. I had no idea what was expecting me yet . . .
Our adventure started with a 1-hour ride to Puerto Colotun, where we embarked a Piragua, a typical Embera-canoe, for our exciting trip to the Embera Drua village. While on our way to the port, we were already able to see different sides of Panama: passing the metropolitan City towards the countryside, and from there entering the lonely Chagres National Park, where life is more laid-back than in the City, and skyscrapers and fancy restaurants are not a lot of people’s business. But the fun part started on the piragua, which carried us through green and ever greener landscapes that provided enough space and the perfect environment for all kinds of birds and animals. Our client Mr. Sameth was at a loss for words, while Mrs. Sameth got a little nervous on our quite unusual piragua-ride. Guide Fabio managed to keep us all in a good mood though, explaining us everything about the area, and all of us were excited to arrive at the Drua village. 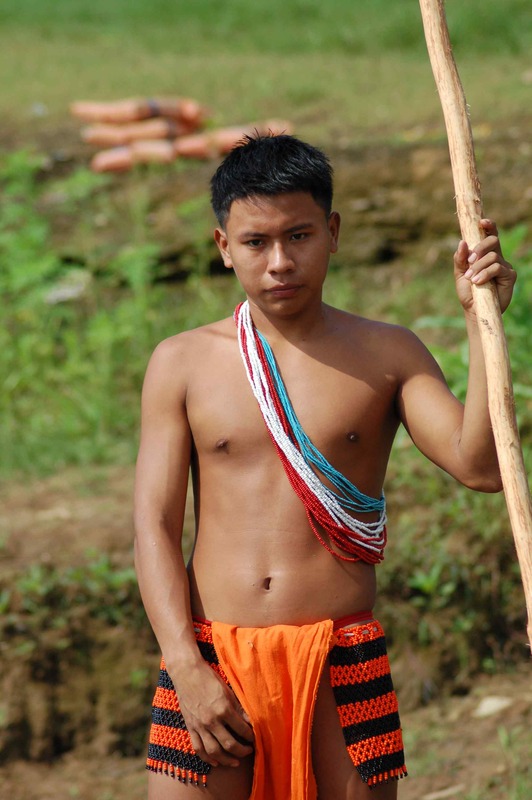 Upon our arrival to the 93-people-community, we were kindly welcomed by the Embera, all of them seemed pleased to have us there, while at the same time we didn´t seem to distract them much from their daily routine, which we liked to see. The village is built in a very rustic style and makes you think back in time, when people used to live without any technological devices and when capitalism wasn´t as present as it is today. 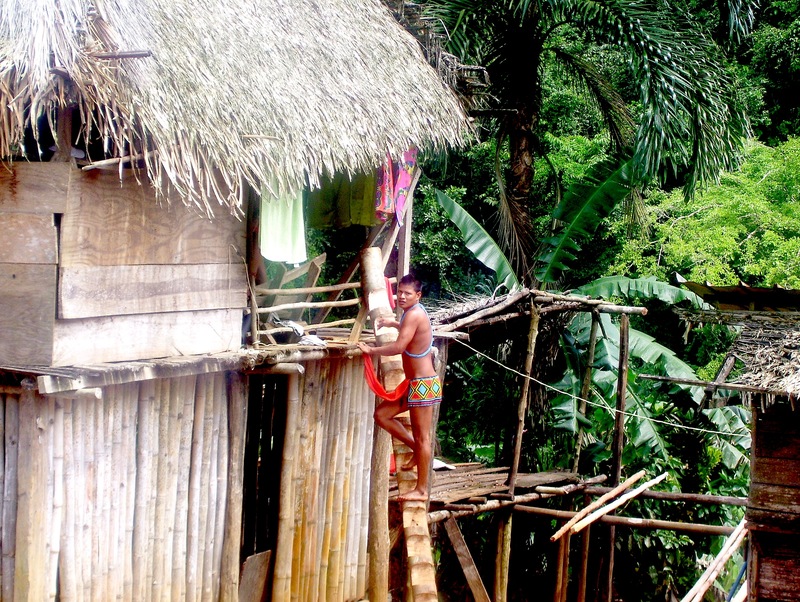 The houses are all built with natural materials: wood & different types of dried leaves as protection against rain; to enter you need to climb up a latter. A lovely young Embera girl approached us and wanted to explain us a little bit about her culture. She gave us a nice presentation about the history and present culture of the Emberas. Mr. & Mrs. Sameth, as well as myself, were listening carefully and questions about how things work in the community kept popping up in our minds. She patiently answered all of our questions while a number of other Embera girls were gathered under the same open roof than us, chatting, cooking or playing with their kids, just living their everyday life. To round-off the presentation about the Embera culture, we were served a typical lunch: fresh fish (oh how fresh!) & Patacones – delicious! After lunch we were able to explore the rest of the village, take pictures, and have any new questions answered by guide Fabio. We spent some time watching little boys play soccer, and at the same time we were observing everything else happening around us. With a bunch of new impressions on our mind, we left the Embera village with a smile on our faces. We were treated very nicely by everyone in the community and felt very welcome. On our way back to Puerto Colotun, where driver Roberto was already waiting for us, we barely said a word, but instead reflected on what we had experienced during this adventurous day. Early in the morning, we get to the Chagres River, the main reservoir of drinking water for the cities of Panama and Colon, also supplies water for the operation of the Panama Canal. Here we board a dugout canoe with motor and travel up the River to the Embera Drua village. 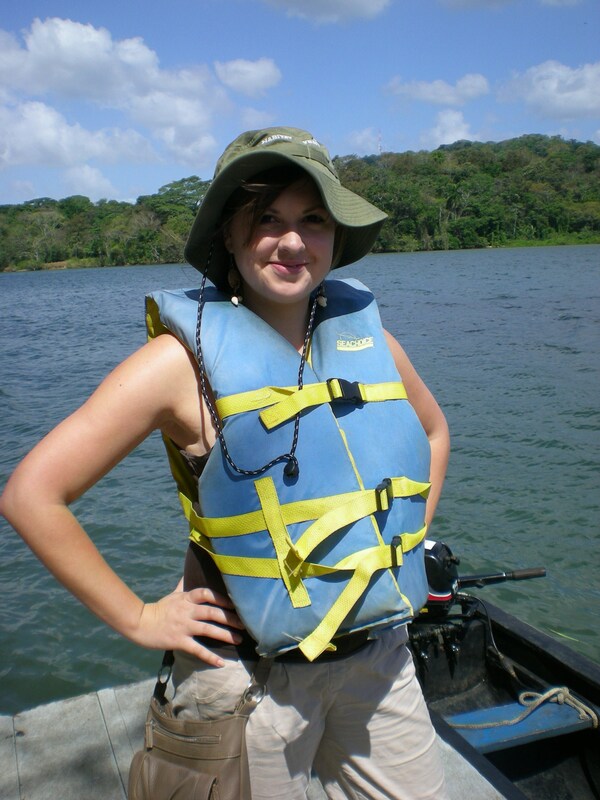 The boat journey of 45 minutes takes us through lush rainforest of the Chagres National park. From the boat it is possible to admire the beauty of the rich and flourishing nature; there is a complete silence, broken only by the sounds of the water and of the birds. 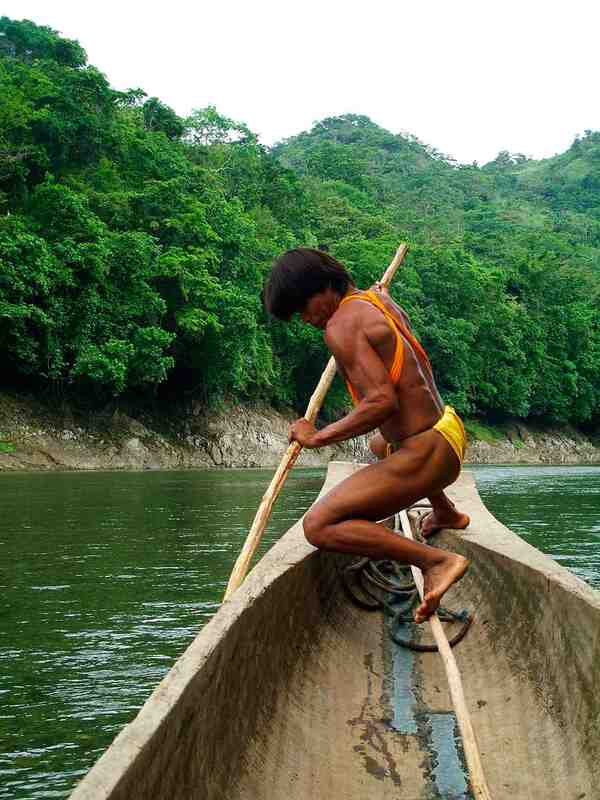 The river is the only way to get to the Emberá village, otherwise it is possible to walk through the forest but that will take no less than 4 hrs. During the rainy season the river will rise a lot, while during the dry season the level of the water will be very shallow, causing problems to pass through some places. The Emberá community was founded in the Chagres national Park in 1975, and today counts 115 inhabitants, of which 30 are kids. In 1996 a school was built also thanks to the contribution of organizations, tour operators and individuals who strongly support the protection and conservation of the environment end the life of the Indigenous communities. There are often volunteers who spend some time within the village, offering help and doing researches. When we arrive, a representative of the Emberá community explain us everything about their history, way of living, traditions, dances, music, together with the help of some women that show us how they make handcrafts using palms fibers, woods, leaves, rocks, etc..
All the handicrafts they make are on sale at their small picturesque market. We have also the chance to get our body painted, as the Emberá usually do, using a particular ink made of ashes and plant pigments. The tattoos will last about 8 days. At lunchtime we sit together enjoying the delicious freshwater fish, Tilapia and Sargento, accompanied by crispy platanos y a bunch of fresh fruits, such as pineapple, passion fruit, watermelon, bananas..
After lunch we move to another open air building, where the Emberá women will perform local dances on the music played by the men using artesian flutes and drums. The first dance is performed in between them, while in the following ones everybody will take the floor and show their dancing skills! Once we have done with that, unfortunately It’s time to board again on the piraguas and go back to the “real word”, but confident with the fact that our soul is fulfilled with the best emotions and feelings that the wonderful people of the Emberá community were passionately able to transmit to us. Léa Maillard & Paola Alzatti.